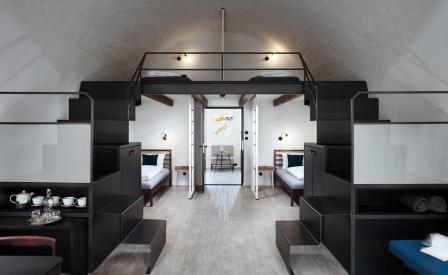 Inspired by her travels, entrepreneur Eva Dlabalová has supplied the new generation of digital nomads with a casually hip hostel in the Czech city of Olomouc. Located in the old town, a short meander away from the main square and other ecclesiastical sights such as the Holy Trinity Column, the horseshoe-shaped building holds 56 beds over a series of private and dormitory rooms. Inside, the pleasingly spare interiors are courtesy of designer Denisa Strmisková who dressed the spaces with a mix of vintage furnishings and sleek custom-made beds, mirrors and bathroom fixtures that offset the original vaulted ceilings in a modern monochrome palette. A new café and restaurant are due to open soon, but for now, the onsite bistro serves up breakfast and small snacks such as house-made soups and sandwiches. Meanwhile, the common areas are also to be extended to include a new outdoor terrace- perfect for working, meeting and greeting or exchanging travel tips.